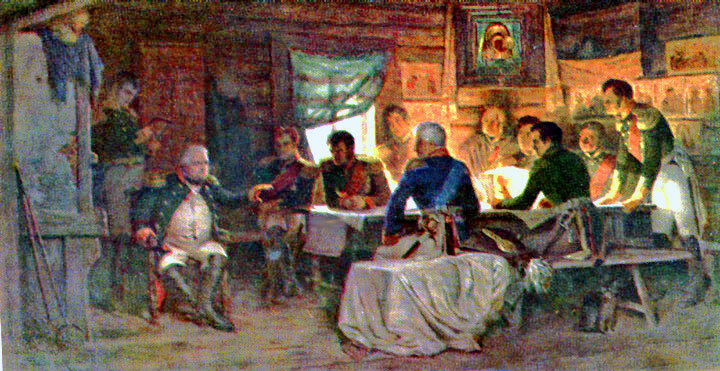 The commander of the Russian combined armies at Borodino. 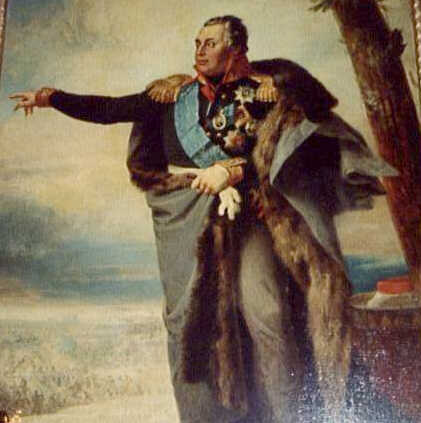 This portrait hangs in the 1812 heros gallery in the Winter Palace, (Hermitage Museum) in St Petersburg. Here is another portrait from our collection, and another. There is a fine wax figure of Kutuzov in the special exhibition on the Romanov family. Some of the items shown in the special exhibition on Kutuzov in the Museum of Artillery include his camp bed, his field writing desk, and numerous memorabilia, paintings, regimental banners and uniforms. These are shown at the section on the Artillery Museum And here is the famous painting of Kutuzov and his staff at Fili, just before deciding to abandon Moscow.